UK: DBB Jack-up has replaced three gearboxes at the 60MW Scroby Sands offshore wind farm in the UK for E.on. 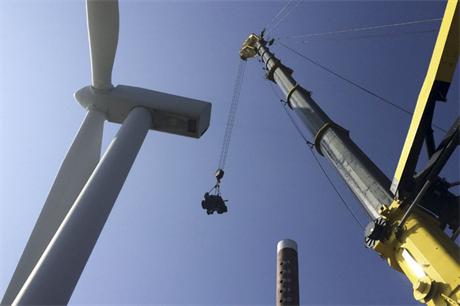 The gearboxes of the 30 Vestas V80-2MW turbines were coming to the end of their working lives. The replacement involved a straight swap. "We had followed a regular maintenance schedule involving visual inspections, oil sample collection and condition-based monitoring. "The combination of these three maintenance methods revealed that the gearboxes on three turbines needed changing. But it wasn't really a surprise as we had expected the gearboxes to last for about 7–8 years," said Keith Cooke, operations manager at Scroby Sands. The gearboxes and generators in all of the turbines – which came online in 2004 – have previously been replaced due to endemic faults with the components. The turbines passed out of warranty in 2010, with E.on taking direct responsibility for operations and maintenance at the project. DBB used its J/U WIND jack-up vessel to replace the gearboxes, which took six days to complete.